A few months ago, my family started a new tradition: making dinner together on Sunday evenings. We don’t do it every Sunday, but we do it quite often and the reminder for us to make it happen almost always comes from one of our two boys. I wish I could say their desire to cook is due to their passion for cooking (they both like it fine, but Legos, playing outside, and drawing are definitely preferred) or because of my Mary Poppins-like ability to make every activity fun. But, to be totally honest, I think it’s due to a combination of a natural curiosity about food on their part and a lot of hard work and letting go on mine. You see, I’m a little intense when it comes to the kitchen. My natural inclination is to keep things tidy and efficient, which has created a lot of hiccups along the way—times when I snapped because something spilled, times when I just took over for efficiency’s sake, times when I felt hurt because they lost interest and wandered off. 1. Give them choices around the kitchen tasks. Especially if your kids are reluctant to join you in the kitchen, offering choices can be a great way to get kids engaged in the cooking because they feel as if they have ownership. Do you want to crack the eggs or mix the ingredients? Do you want to help with the salad or with the sauce? This also means allowing them to choose ingredients when possible. What vegetables would you like to put into the salad you’re making? What toppings should we put on the pizza? What should we grill this evening? 2. Don’t hover. When we hover, we send the message we don’t trust our kids in the kitchen. They sense our anxiety as we watch things happen out of order or differently than we would like. Instead, get them started on a task and then occupy yourself with something else. When you first start cooking with your kids, this might look like pre-measuring and then letting them dump and mix, while you put dishes into the dishwasher. When they are more comfortable and confident in the kitchen, it might be taking the ingredients out for them and then talking them through what they need to measure, while you work on another dish. When they are doing really well, it might be deciding on a dish and then letting them go at it, just making sure you are available for questions. 3. Allow for escapes. When they lose interest or when something else comes up, let them bow out (making sure they clean up their mess first, of course!). Don’t guilt-trip them or get frustrated with their lack of focus. If they feel like they have to stay, it becomes a burden. The more they enjoy their time in the kitchen with you, the more they will want to stay. 4. Give them tasks that will be fun and helpful. In almost every cooking project, there’s at least one task that will be fun for them and helpful for you. What kid doesn’t love to mash potatoes? Smearing garlic butter on already sliced French bread? That was one of my favorites growing up! Whenever possible, let the job be one where they can point to their accomplishment and say, “I made that!” Assembling a salad from start to finish, mixing up pancake batter, putting the toppings on a Mexican pizza, or scrambling eggs are all tasks that will fill them with pride and make cooking that much more appealing. 5. Be patient. Yes, there will be times when the flour goes flying, the cooking moves more slowly, and you just want to grab the spoon and finish the dish on your own. I’ve been there! It’s ok. Just take a deep breath and remember: in the end, the benefits to their self-confidence and the delicious food will make it all worthwhile! Create opportunities for competence. Kids are more capable than we think. If we set the right guidelines in terms of safety, kids can do a lot more than we give them credit for. Yes, I was a bit of a wreck the first time I let my son use a paring knife. But I reminded him of the rules of thumb for using a sharp knife, skills we had practiced with butter knives. I held his hand for the first few cuts and then stood by his side to let him try on his own. Would I walk away and leave him with a sharp knife? No. But giving him the opportunity to try it out in a safe environment gave him confidence and pride. 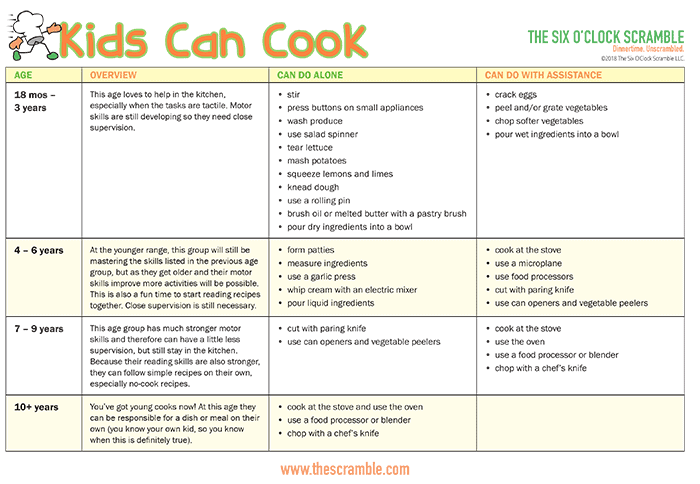 See the chart below of developmentally appropriate cooking tasks for each age. What are you waiting for? 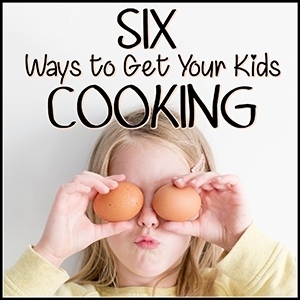 How can you get your kids involved in the kitchen this week? Jessica Braider is a certified health coach and mother of two active and playful boys. 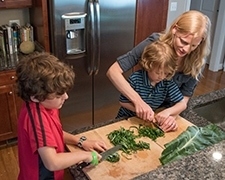 As the CEO of The Six O’Clock Scramble, an online meal planning service committed to helping busy families get quick, easy, and delicious meals on the table every night, she fulfills her passion for food and her love for working with parents and children to build healthy and happy families. Jessica received her training as a health coach from the Institute for Integrative Nutrition. She also holds a Master of Social Work from the University of Michigan. In her downtime, you can find Jessica in the kitchen experimenting with recipes or outside enjoying time with her husband and kids.